The world's first fisheye lens developed for the Nikon DX Format digital SLRs: D40/X, D60, D80, D90, D200, D300, D2X. The Nikon 10.5mm fisheye lens enables a unique 180-degree picture angle, close focusing down to 14cm and the kind of incredible depth of field (DOF) properties characteristic of fisheye lenses. 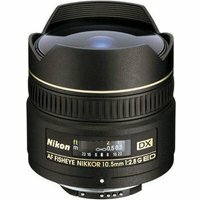 The Nikon 10.5mm fisheye lens is for use on DX digital cameras only. Features an integral lens hood.